﻿	Woman in the Middle » Duck! This spring we are having a particularly stubborn duck problem. As I mentioned in a previous post, we had a couple of mallard ducks, as in a male and female, who were very hard to scare out of the pool. We had to resort to water spraying and net waving to get them out of the pool and out of the yard. The ducks very cute and it feels quite lovely to look out the back window and see them gliding on the pool or sleeping beside it…until we go outside and see the entire edge of the pool tile is covered in duck poop and that the pool has turned into a green murky mess. 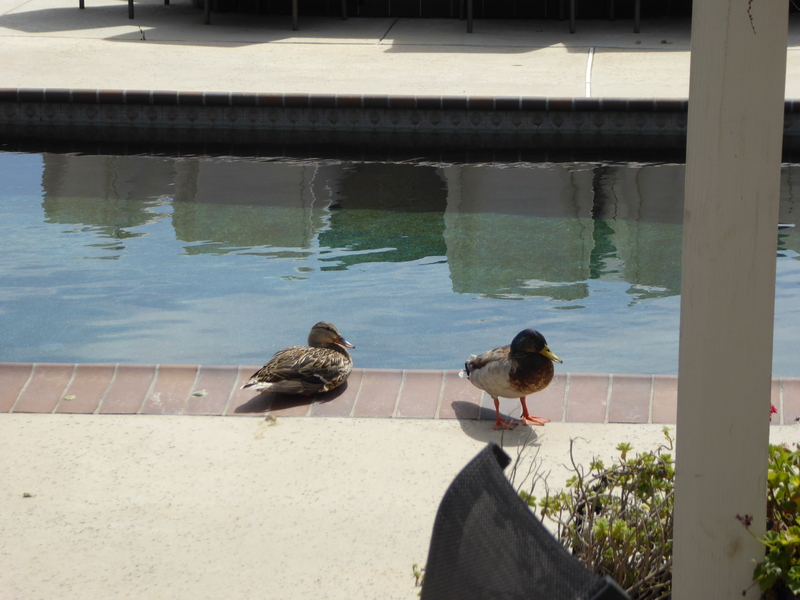 As Hubby said, the duck poop is messing with the pool chemistry. Duck poop feeds the yellow algae that loves to live in So Cal pools. Hubby spent quite a bit of time last weekend trying to get the pool back to clear status. There was vacuuming and brushing going on (I helped with the brushing) and that continued Monday evening after he got home from work. Just as the last of the daylight was going away, Hubby finally finished. The pool was fully vacuumed and brushed, the filter, which was by then full of algae, was pulled apart, cleaned, put back together, and we had a nice clear pool once again. Then, just as he could sigh at a job well down, Hubby heard the tell tale flapping of wings. As it was now dark, all he could do was hear them come in and then, plop, plop, plop, plop, plop, plop. Six ducks landed in that clean pool! Six, not just a pair, but three pairs. The original pair must have told the others about that great honeymoon place, our pool, or as I call it now, Chez Duck Love. Yep, felt like we are running a duck honeymoon hotel! I have doubled down on chasing the ducks away. Our original pair seems to have split up and the male likes to swim in the pool and quack his fool head off, trying to lure a new mate to Chez Duck Love. It hasn’t worked out so well for him. Now we have a pair of male ducks hanging out, or, as Eldest calls them, the Gay Ducks. I don’t think they are gay, I think they are just pals. But, whatever they are, I do not discriminate. All ducks must go! I went to a meeting last night at a house not too far from my own. They have a pool, too. And the lady who lives there said she saw a duck in her pool, for the first time ever! I just looked at her with pity. Little does she know what is to come, if her house becomes the next duck honeymoon hotel. The stubborn duck couple, in happier times, before the break up. We have a small pond and one year a mallard couple tried to nest near it. We were fortunate that there are protected game lands within a quarter mile. They left and we haven’t seen them again. Excuse me while I go knock on wood so they don’t come this year! The golf course next door has ponds, including one near us, which has resident flocks of ducks. So we have a ready supply near by! Hubby thinks our pool’s black bottom also makes it more attractive to them because it looks more like a “real” pond. Who knows. I just know I am getting my exercise this year!